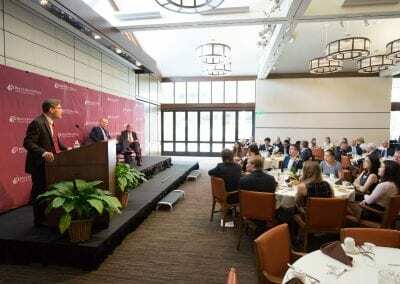 The US presidential election has challenged many assumptions about the Constitution, the political process, and shaken the foundations of the two leading political parties. 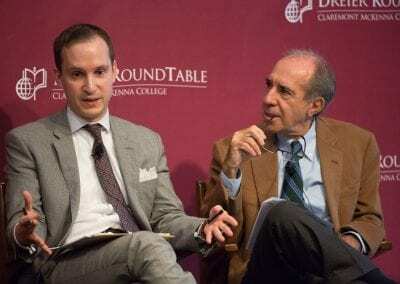 The aftershocks of the Brexit vote are still being felt in Europe, and France is headed into a legislative and presidential election likely to be shaped by populist discontent over immigration and defense. 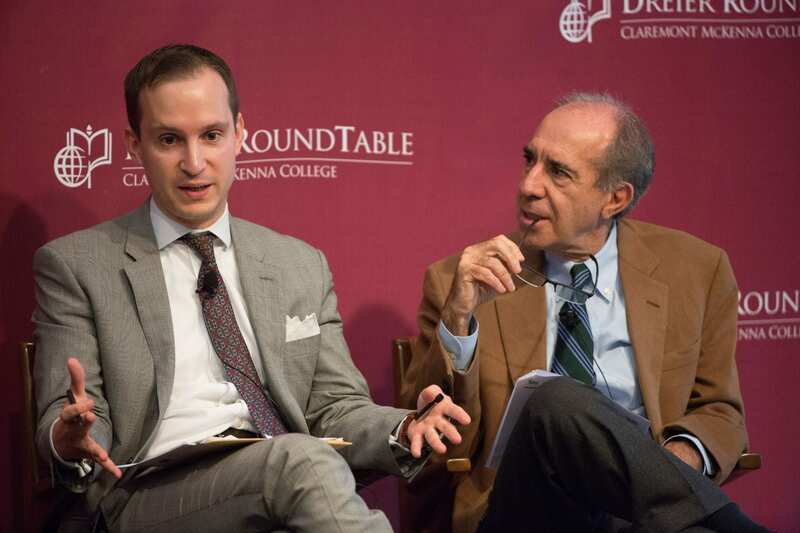 On both continents, economic populism is turning public opinion away from free trade and globalism and toward nationalism and isolation. 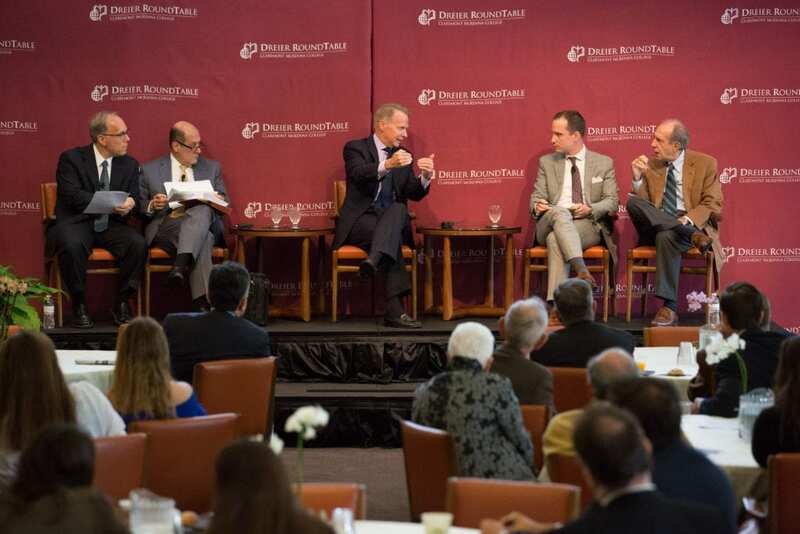 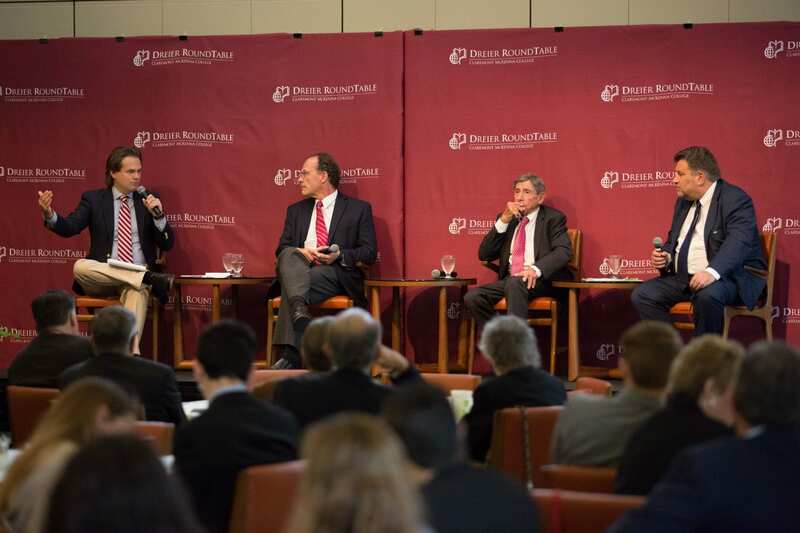 On Friday, October 28th, DRt’s third annual conference focused on these rising tides of populism, both in the United States and abroad. 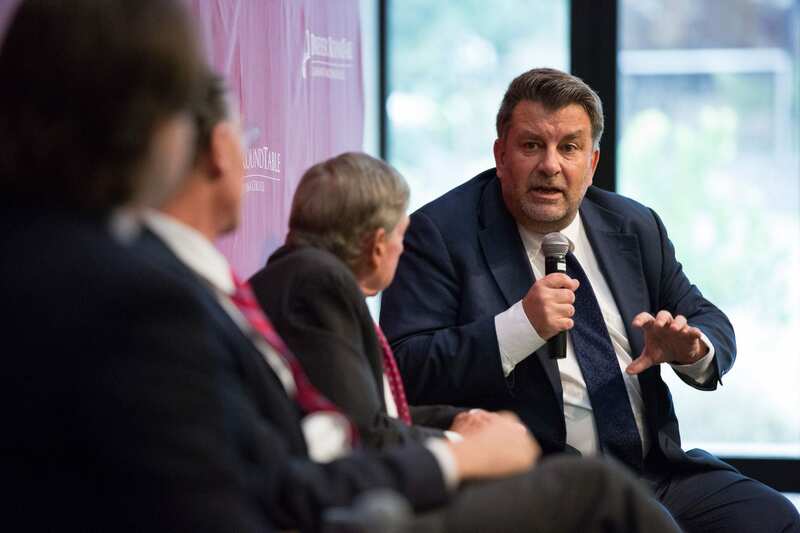 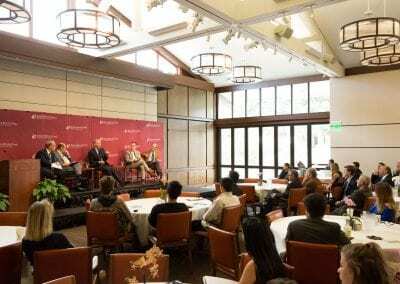 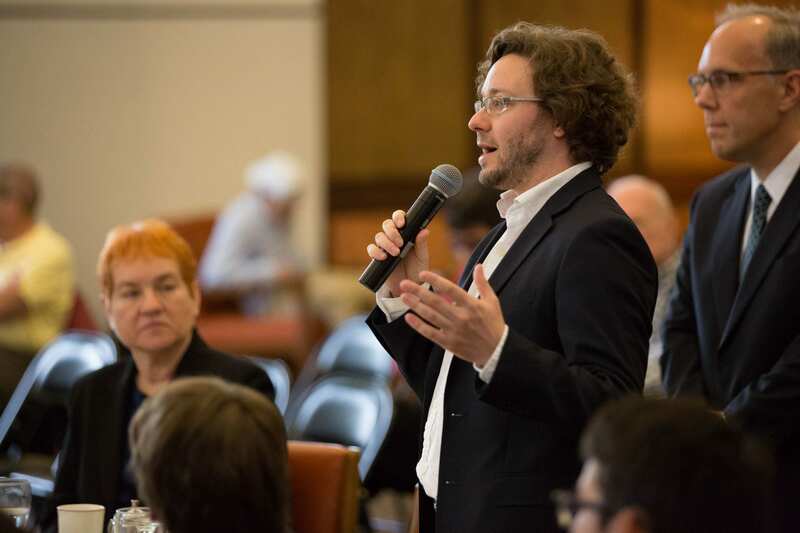 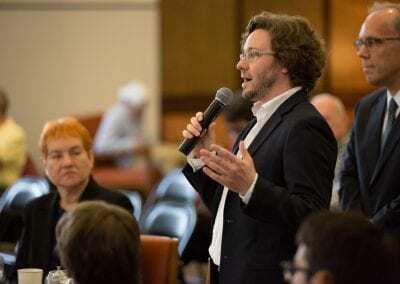 During two panel sessions and a keynote discussion, public policy leaders and researchers from around the world gathered to discuss how our unpopular politics will affect the future of elections and trade. 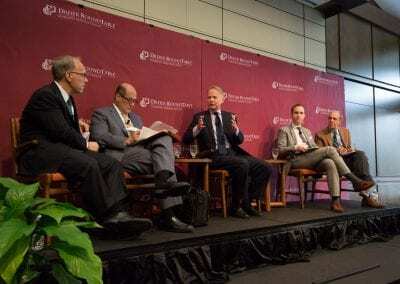 One panel focused on economic populism and its effect on global free trade, and the other on how party politics have been disrupted by populist protest in the US and Europe. 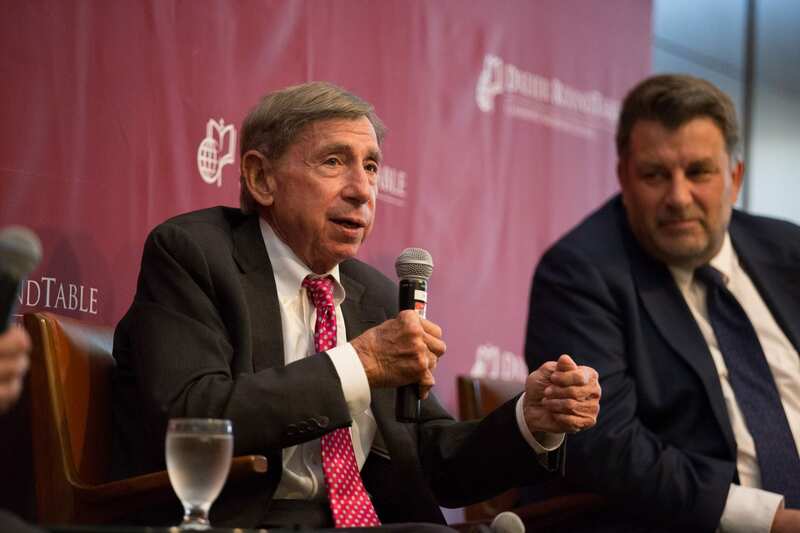 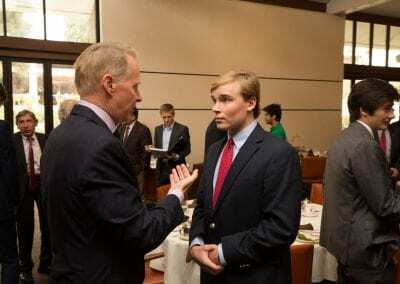 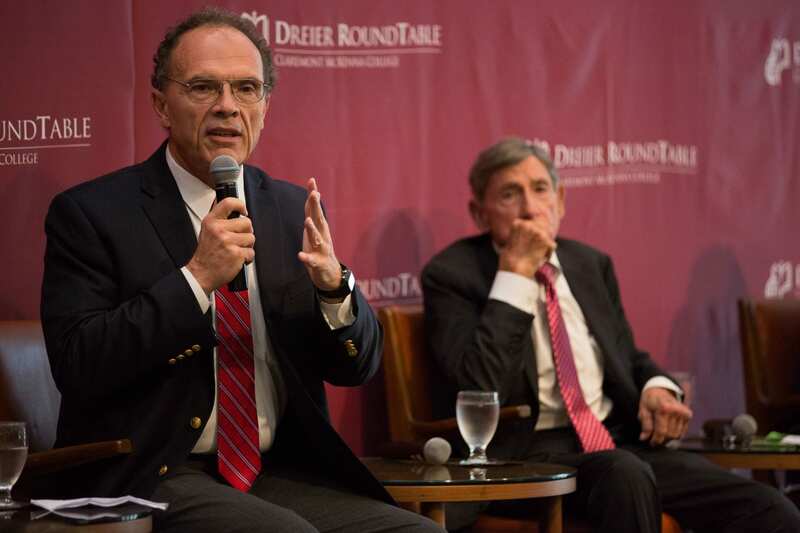 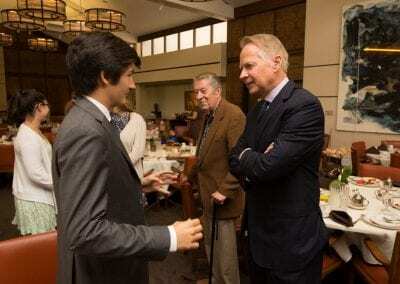 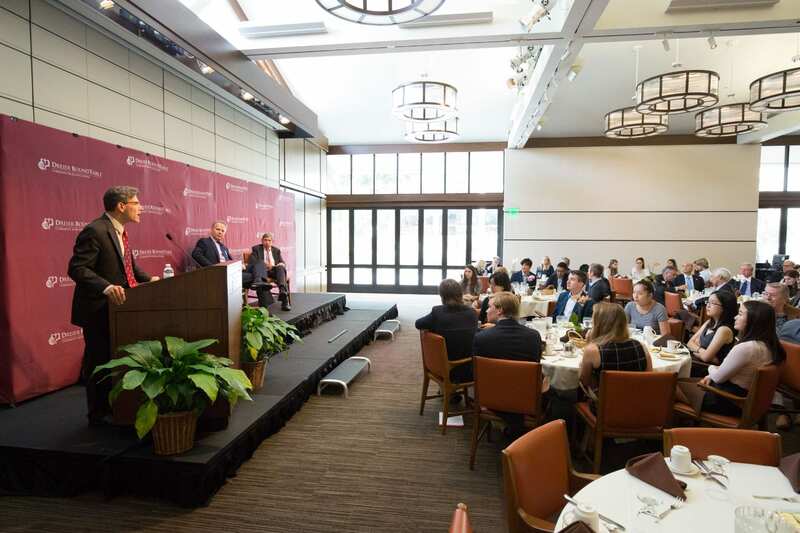 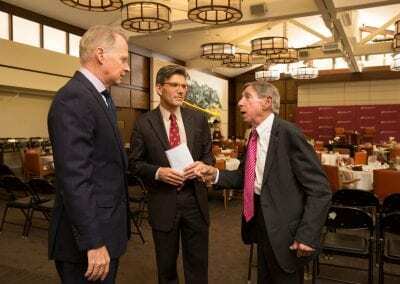 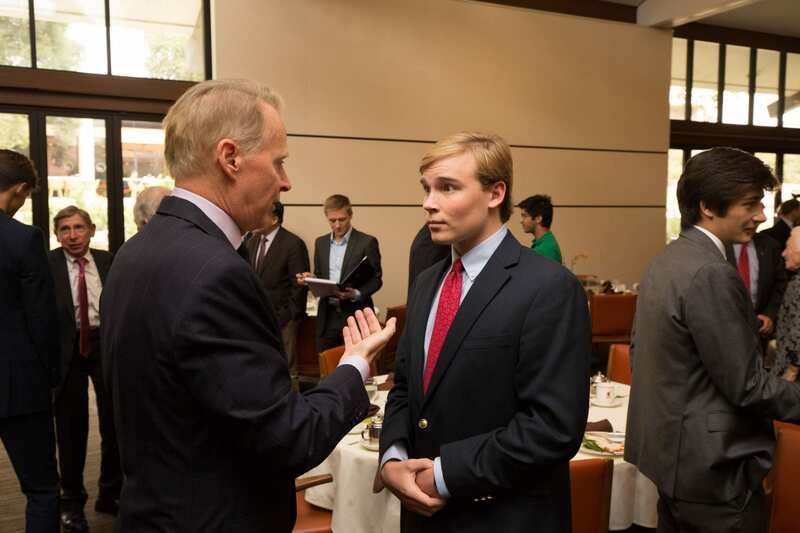 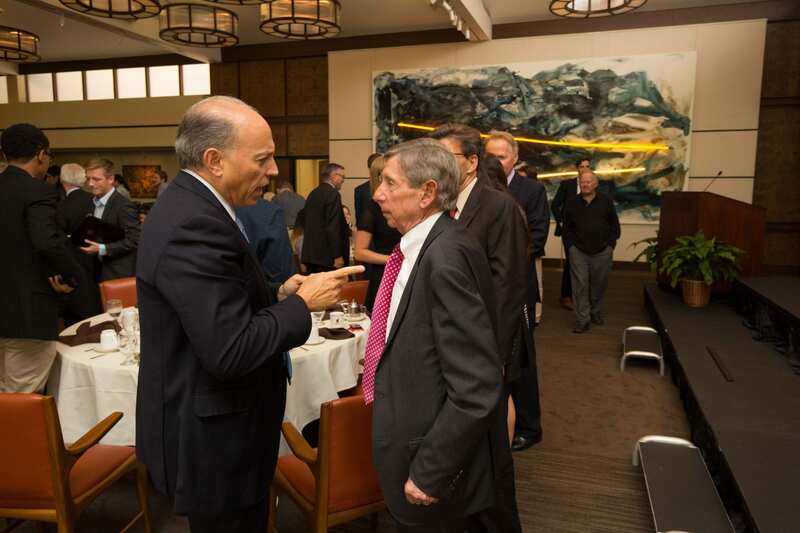 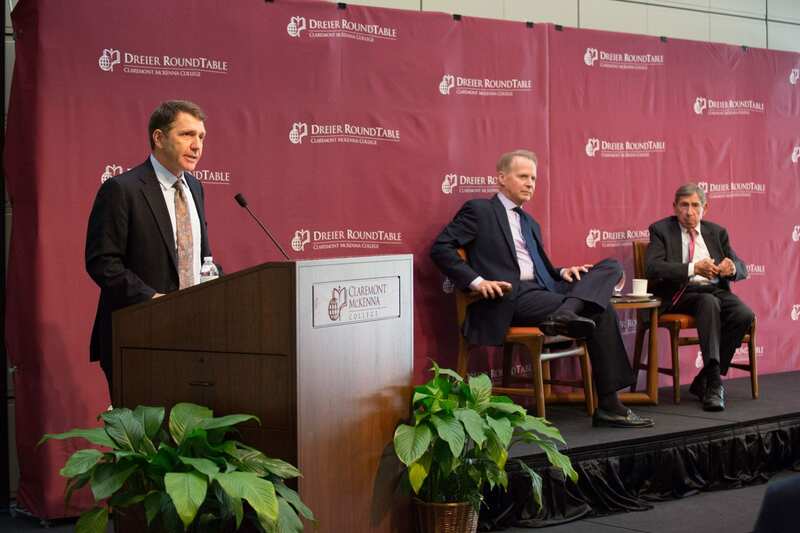 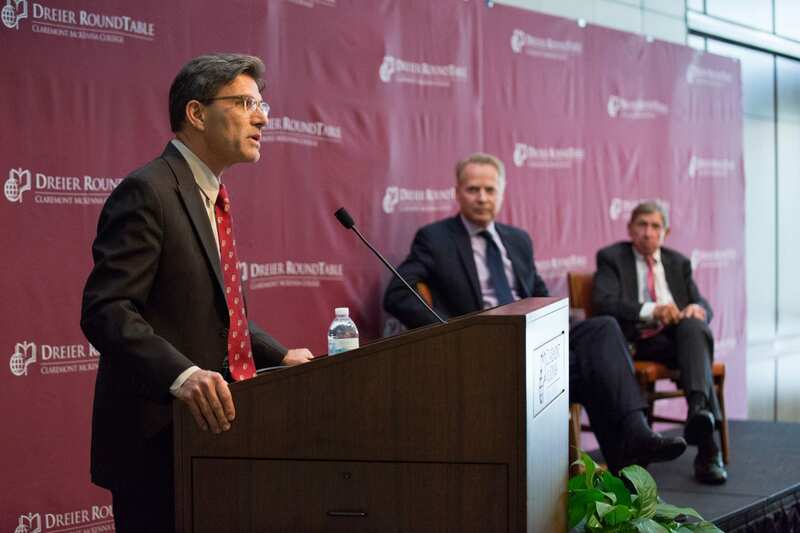 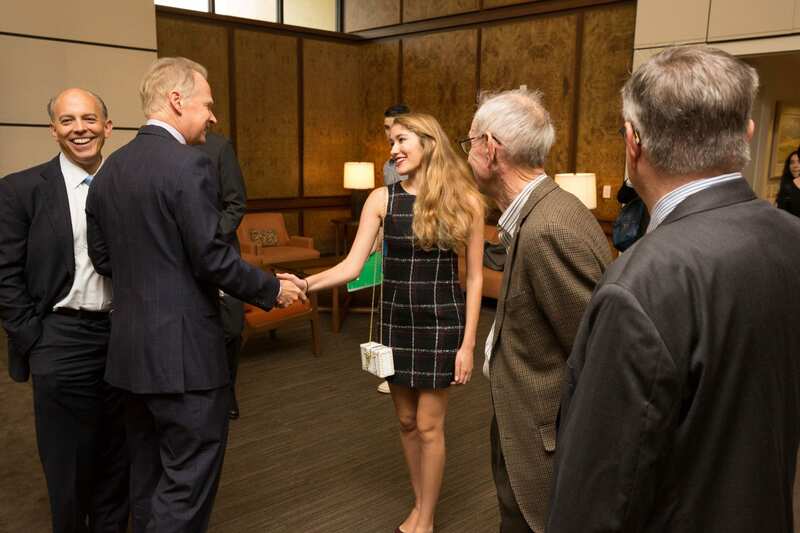 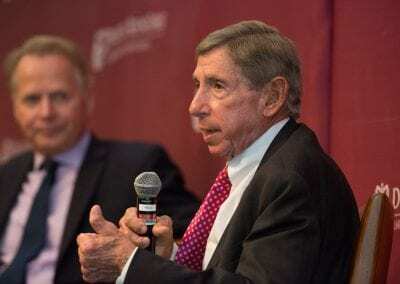 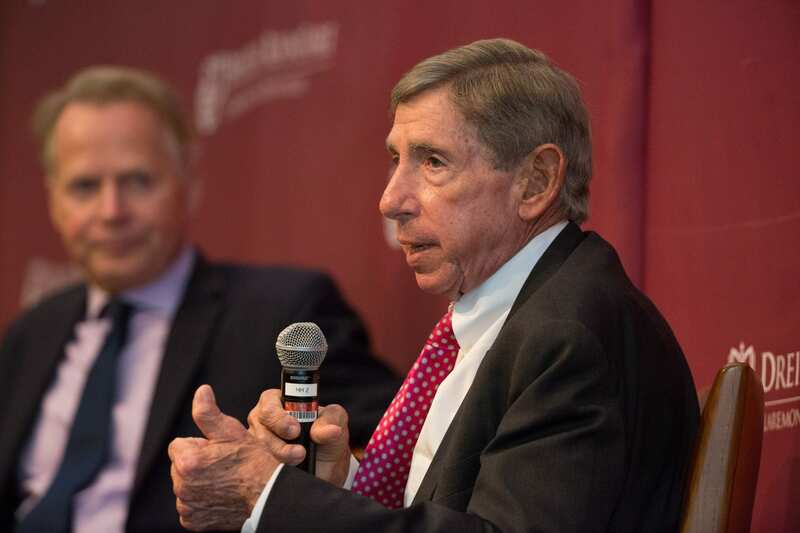 This year’s keynote discussion took place between Chairman David Dreier ’75 and Mickey Kantor, former US Commerce Secretary, U.S. Trade Representative, and chair of the 1992 Clinton/Gore campaign. 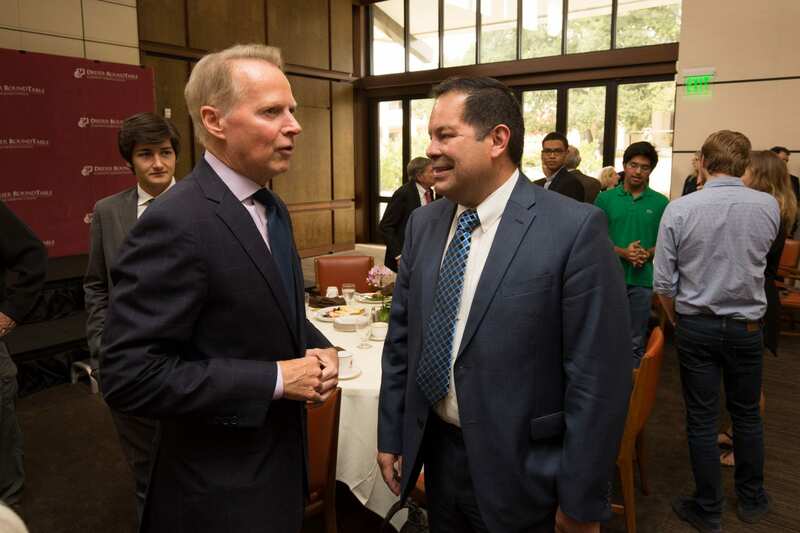 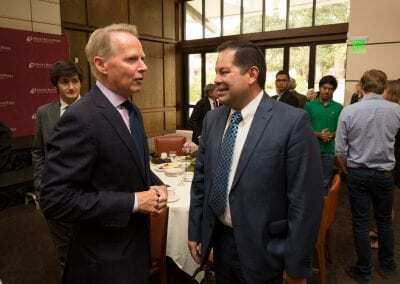 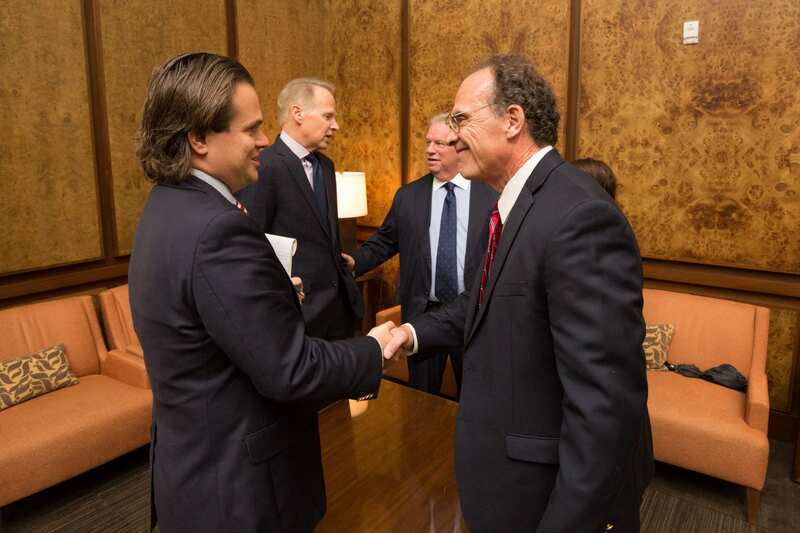 Guillermo Aguilar-Alvarez P’19, former principal negotiator for Mexico on NAFTA. 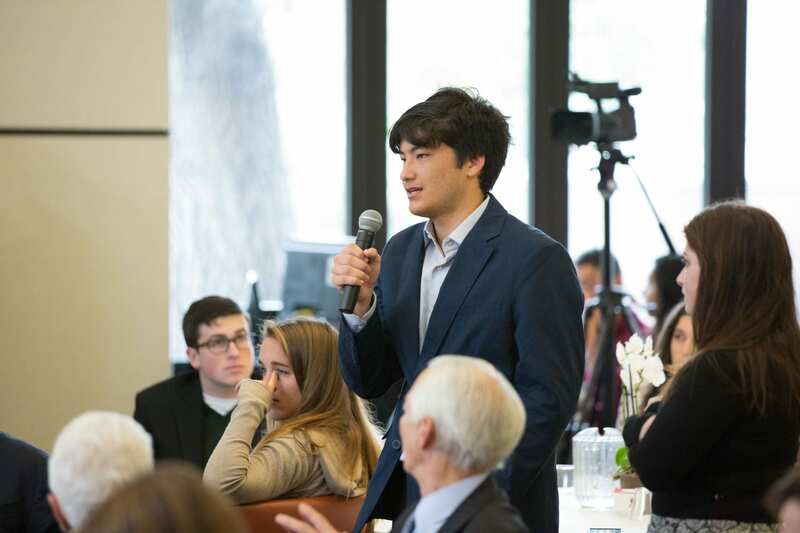 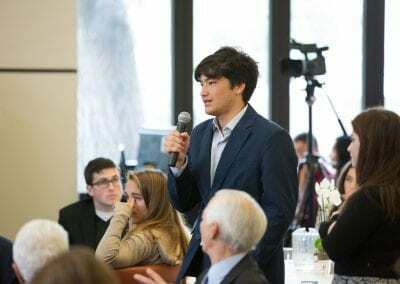 Chris Brigham ’09 asks a question. 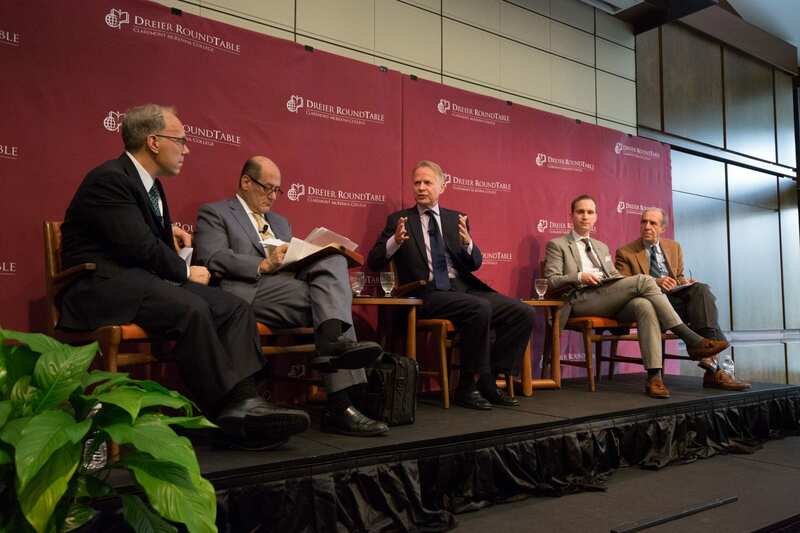 Left to Right: Eric Helland, Guillermo Aguilar-Alvarez, David Dreier, Dalibor Rohac, Jaime Serra Puche. 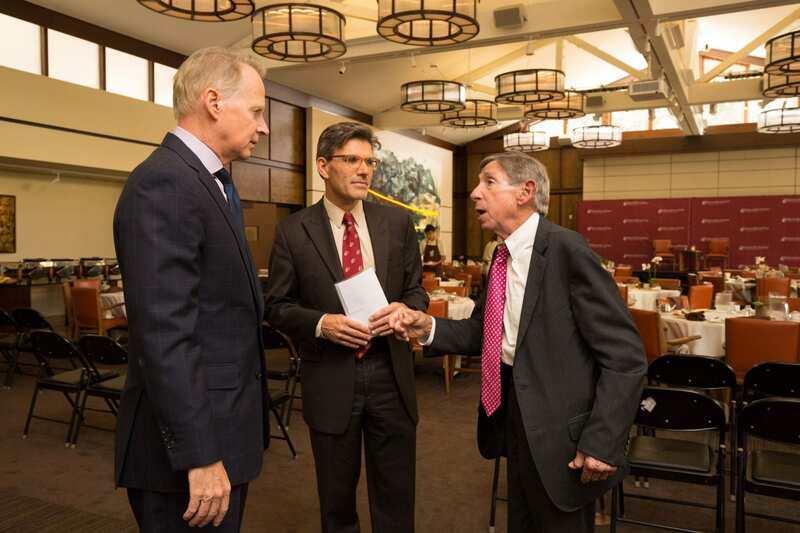 Introductions by President Hiram Chodosh and Prof. Kenneth P. Miller. 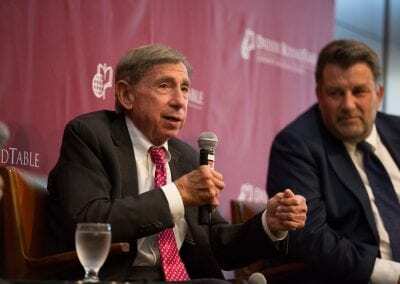 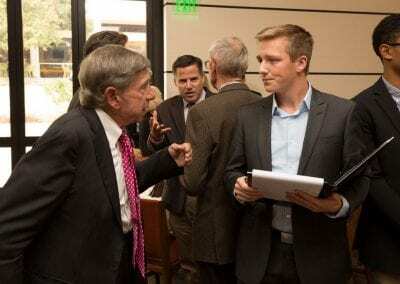 Left to right: David Dreier and Mickey Kantor. 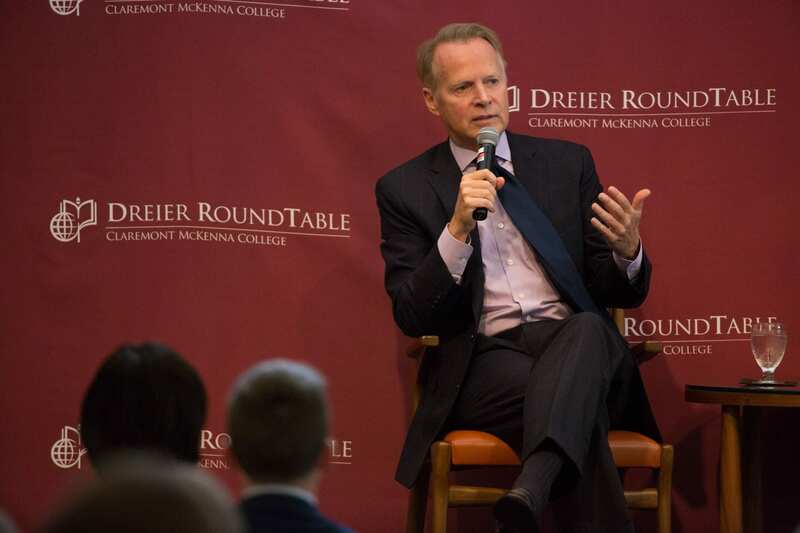 Former House Rules Committee Chair, Congressman David Dreier offers his reactions to President-elect Donald Trump’s surprising win and tells NBC4’s Conan Nolan why he is hopeful for immigration reform under the new administration. 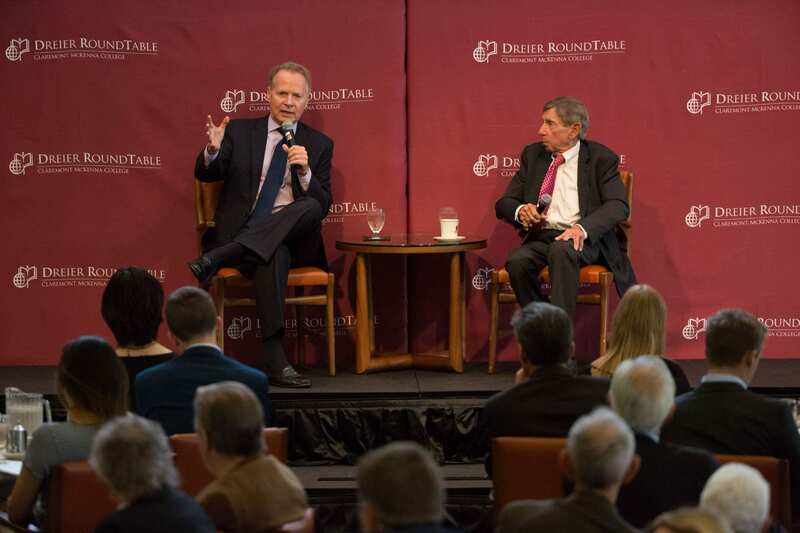 Also, he draws some parallels between Trump and Arnold Schwarzenegger, as well as discusses the future of healthcare policy and news publications. 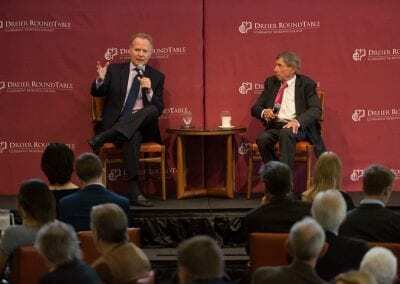 Additionally, he discusses the transition for the Trump administration into the White House and some of his cabinet picks, including Rep. Jeff Sessions for Attorney General and Mike Pompeo for Director of Central Intelligence. 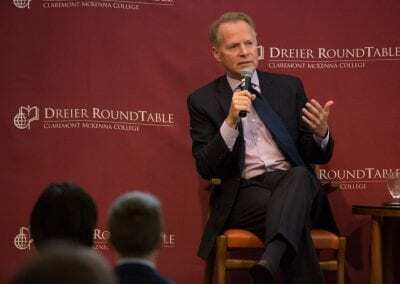 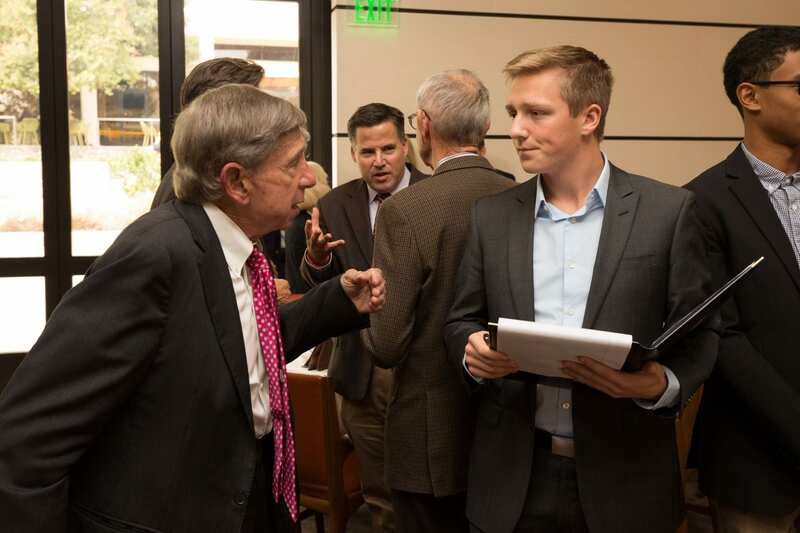 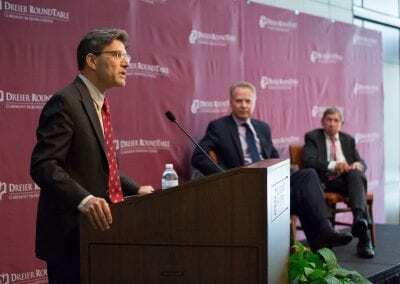 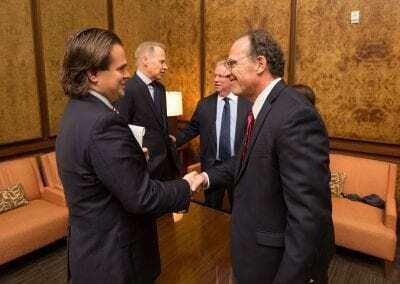 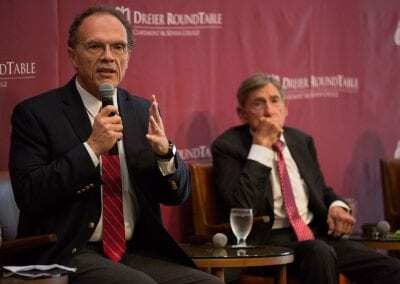 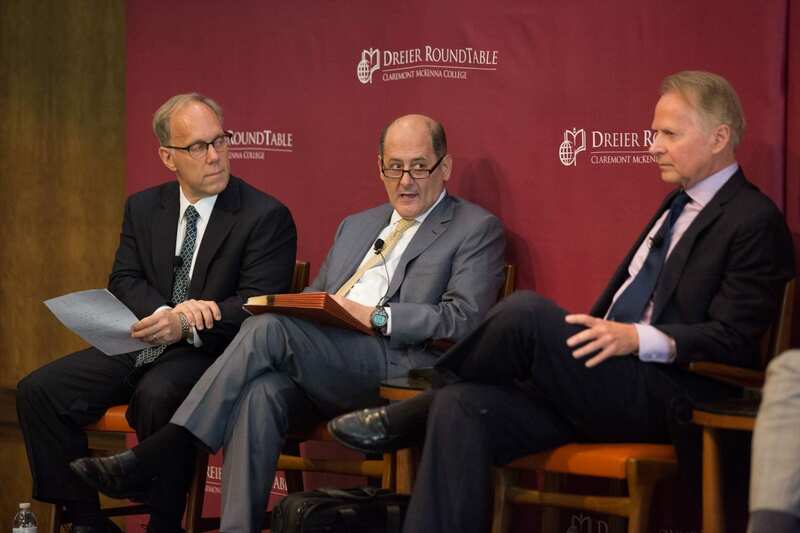 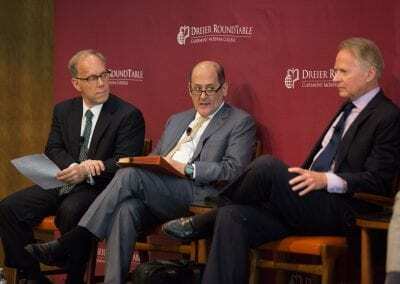 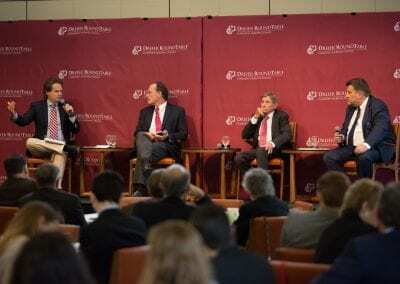 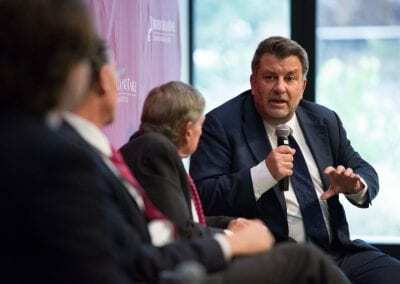 Finally, he disagreed with Trump’s ‘free trade’ rhetoric and argued on behalf of fair trade agreements, citing the benefits created by agreements like NAFTA explained at the October 28 Dreier Roundtable Conference on populism’s affect on politics and trade.